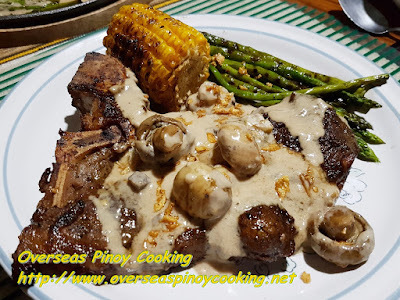 Grilled Tagaytay Beef T-Bone Steak with Mushroom Sauce. 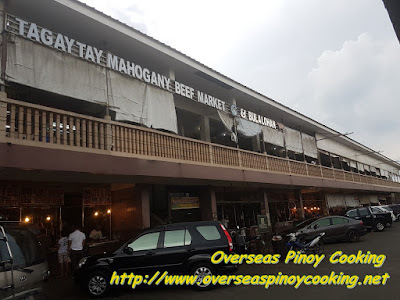 On my recent trip to Tagatay Mahogany Market I have noticed that some of the stalls there are selling also beef T-bone steak cuts, besides the usual Bulalo. Local tourists are also going to Tagaytay for the cheap beef besides enjoying the Taal Volcano scenery and cool weather. Ok back to the T-bone steak, I have noticed that a lot of tourists are buying the Tagaytay beef T-bone steak, this caught my attention. 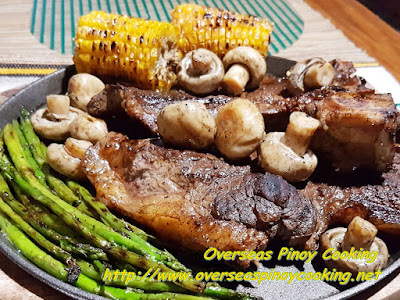 Would the Tagatay beef steaks are as good as their Bulalo? 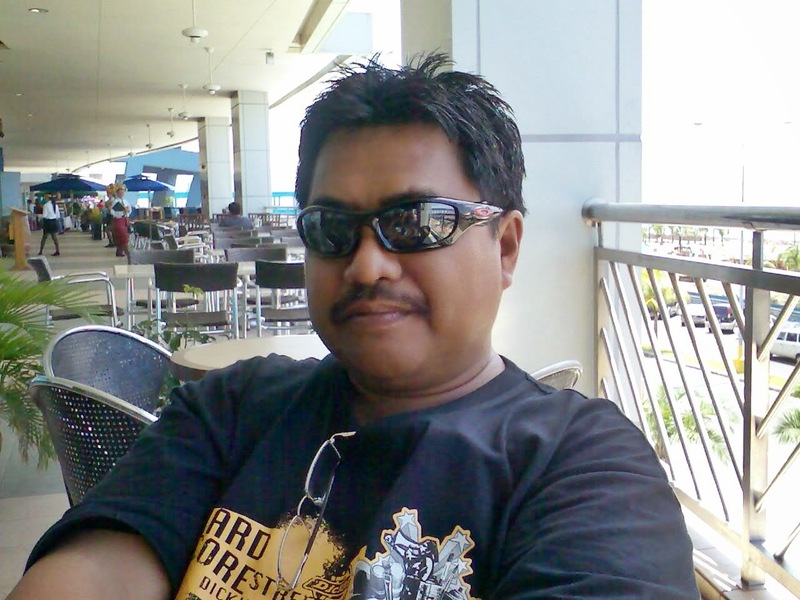 Well the only way to find out is bring home the Tagaytay Beef steaks, bought 1 kilo of the beef T-bone steaks. I asked the butcher to slice the steaks at about 20mm thick or about the size of a thumb. The one kilo beef T-bone steak yielded four slices. It has been sometime since I had a good grilled T-bone steak that was when I was in Australia. 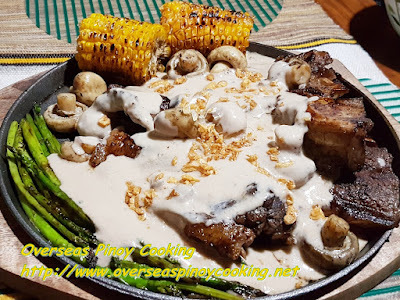 Finally decided to cook the Tagaytay Beef T-Bone Steak grilled, with my old ribbed grill plate and serve sizzling on a hotplate with mushroom sauce with corn, asparagus and caned whole button mushrooms, all similarly grilled on the grill plate. For the mushroom sauce I settled for my usual mushroom sauce using Campbell’s Condensed Cream of Mushroom Soup. The Tagaytay T-bone steak where slightly rubbery, that was expected as I opted to cook the T-bone steaks well done. My beef where bought from the wet market, I am not taking any chances. I do like my steaks medium rare but not this time. Never the less the steaks came out great. You cannot go wrong with Campbell’s Condensed Cream of Mushroom Soup. 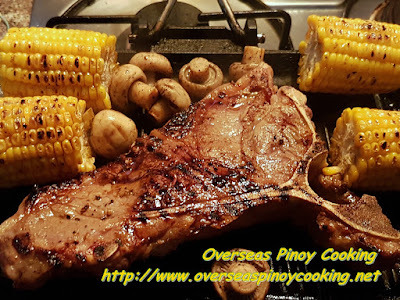 Here is the recipe of my Grilled Tagaytay Beef T-Bone Steak with Mushroom Sauce, try it. To Marinate: Pat dry the T-bone steaks with kitchen paper towels, keep aside. Mix all the marinade ingredients. Marinate the T-bone steak with the marinade mixture for at least 2 hours, keep refrigerated. To Grill: On a grill plate, grill the corn cob for 15 to 20 minutes turning occasionally and basting with butter. Keep aside. Using the same grill plate. Grill the button mushroom and asparagus for 2 to 3 minutes, turning occasionally and basting with butter. Keep aside. Again using the same grill plate grill each T-bone steak for about 8 to 10 minutes each side. Wrap the grilled T-bone steaks in aluminium foil and let rest for 10 to 15 minutes before serving. To make the mushroom sauce: Using a medium sized sauce pan, heat some cooking oil. Fry the garlic until light brown. Scoop out the fried garlic and keep aside. Using the same sauce pan add in the condensed cream of mushroom soup, milk, soy sauce, ground pepper and drippings from grilling and resting the T-bone steaks. Add in about 1 1/2 to 2 cups of water, let boil and simmer for 10 to 15 minutes at low heat or until a thick consistency is achieved. Keep aside. To serve: Heat the hot plate at high heat. Melt the butter on the hot plate. Arrange the grilled vegetables and grilled T-bone steak on the hot plate. Pour the mushroom sauce over the grilled T-bone steak. Garnish with the fried garlic and serve immediately.